With data from 73 ice and sediment core monitoring sites around the world, scientists have reconstructed Earth’s temperature history back to the end of the last Ice Age. The analysis reveals that the planet today is warmer than it’s been during 70 to 80 percent of the last 11,300 years. Results of the study, by researchers at Oregon State University (OSU) and Harvard University, are published this week in a paper in the journal Science. Lead paper author Shaun Marcott of OSU says that previous research on past global temperature change has largely focused on the last 2,000 years. Extending the reconstruction of global temperatures back to the end of the last Ice Age puts today’s climate into a larger context. “The last century stands out as the anomaly in this record of global temperature since the end of the last ice age,” says Candace Major, program director in the National Science Foundation’s (NSF) Division of Ocean Sciences. The research was funded by the Paleoclimate Program in NSF’s Division of Atmospheric and Geospace Sciences. 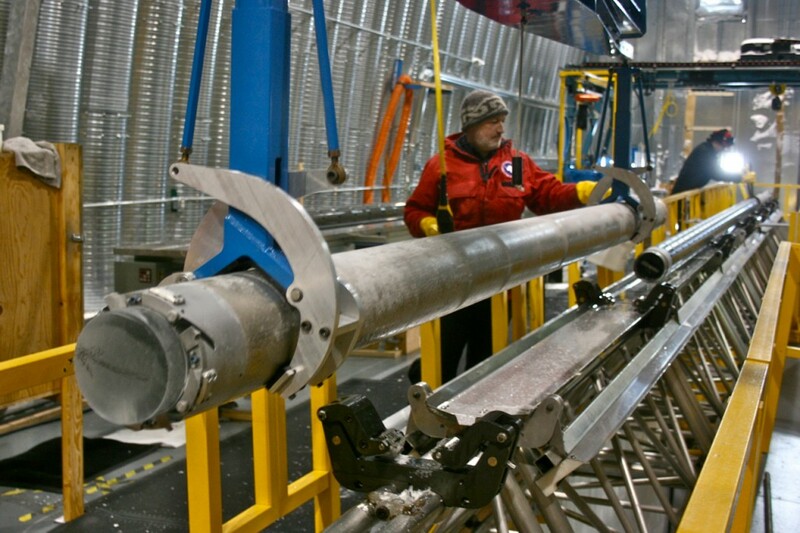 A West Antarctic Ice Sheet Divide ice core barrel is shown. Cores show past air temperatures. Of concern are projections of global temperature for the year 2100, when climate models evaluated by the Intergovernmental Panel on Climate Change show that temperatures will exceed the warmest temperatures during the 11,300-year period known as the Holocene under all plausible greenhouse gas emission scenarios. Peter Clark, an OSU paleoclimatologist and co-author of the Science paper, says that many previous temperature reconstructions were regional and not placed in a global context. “When you just look at one part of the world, temperature history can be affected by regional climate processes like El Niño or monsoon variations,” says Clark. What that history shows, the researchers say, is that during the last 5,000 years, the Earth on average cooled about 1.3 degrees Fahrenheit–until the last 100 years, when it warmed about 1.3 degrees F.
The largest changes were in the Northern Hemisphere, where there are more land masses and larger human populations than in the Southern Hemisphere. Climate models project that global temperature will rise another 2.0 to 11.5 degrees F by the end of this century, largely dependent on the magnitude of carbon emissions. Marcott says that one of the natural factors affecting global temperatures during the last 11,300 years is a gradual change in the distribution of solar insolation linked with Earth’s position relative to the sun. “During the warmest period of the Holocene, the Earth was positioned such that Northern Hemisphere summers warmed more,” Marcott says. The research team, which included Jeremy Shakun of Harvard and Alan Mix of OSU, primarily used fossils from ocean sediment cores and terrestrial archives to reconstruct the temperature history. The chemical and physical characteristics of the fossils–including the species as well as their chemical composition and isotopic ratios–provide reliable proxy records for past temperatures by calibrating them to modern temperature records. Analyses of data from the 73 sites allow a global picture of the Earth’s history and provide a new context for climate change analysis. “The Earth’s climate is complex and responds to multiple forcings, including carbon dioxide and solar insolation,” Marcott says. “Both changed very slowly over the past 11,000 years. But in the last 100 years, the increase in carbon dioxide through increased emissions from human activities has been significant.